Twins Data Quality Suite will detect as many duplicates as possible while eliminating mismatches. The technology is user friendly and allows you to produce state of the art results with innovative ease of use and simplicity. Merging 2 lists with Twins is simple, Twins allows you to compare duplicates and either remove a record from one file or transfer fields such as Telephone numbers. Cross-referencing lists against each other quickly and accurately is the key to effective CRM and one-to-one database profiling. 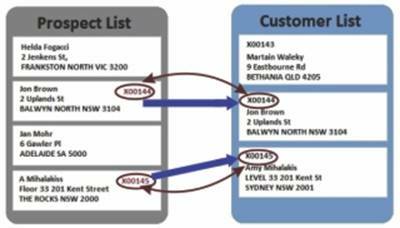 Twins Data Cleansing Suite uses the Australian Postal Address File this makes address formatting and repairing addresses a breeze. Complying strictly with Australia Post AMAS rules and the Australian Standards Twins Data Cleansing Suite will turn messy addresses into high quality data at astonishing speeds of 100,000 records in 4 minutes on a standard desktop PC with no manual interaction required. Advanced Address Repair uses cutting edge technology without the restrictions of AMAS rules to clean even the most difficult data with 100% accuracy. The Advanced Address Repair feature comes with a fully automated component that repairs addresses without the need for any manual interaction and an interactive mode that can be later used for subjective records that could not be repaired automatically. The Australian Phone Number Formatting makes it easy to validate and format phone numbers to the Australian Standards. Twins uses the preloaded phone number format specification from Austel to intelligently format phone numbers based on their number ranges. Missing area codes can easily be added and phone numbers can be easily separated from their area code. Phone numbers are validated on number sequence only.